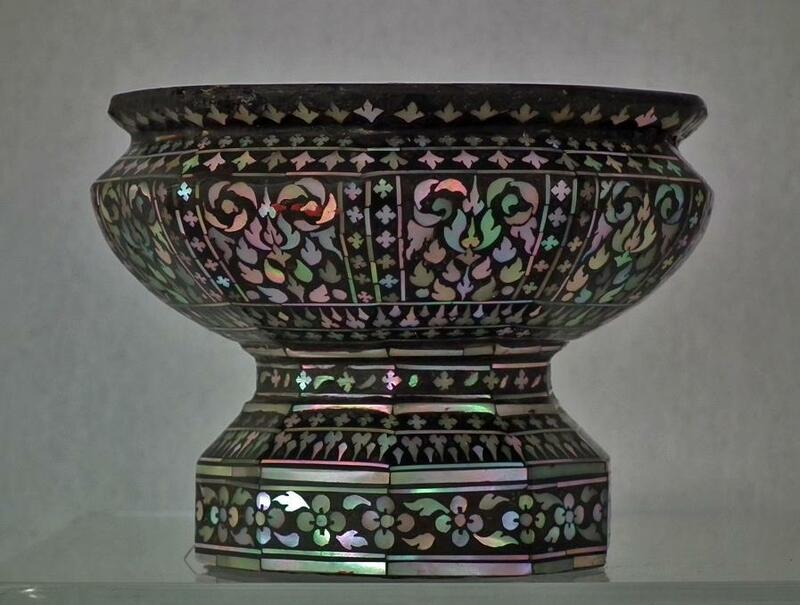 A rare antique, Thai mother-of-pearl inlaid black lac footed cup, or pedestal bowl, Thailand, 18th or early 19th century. 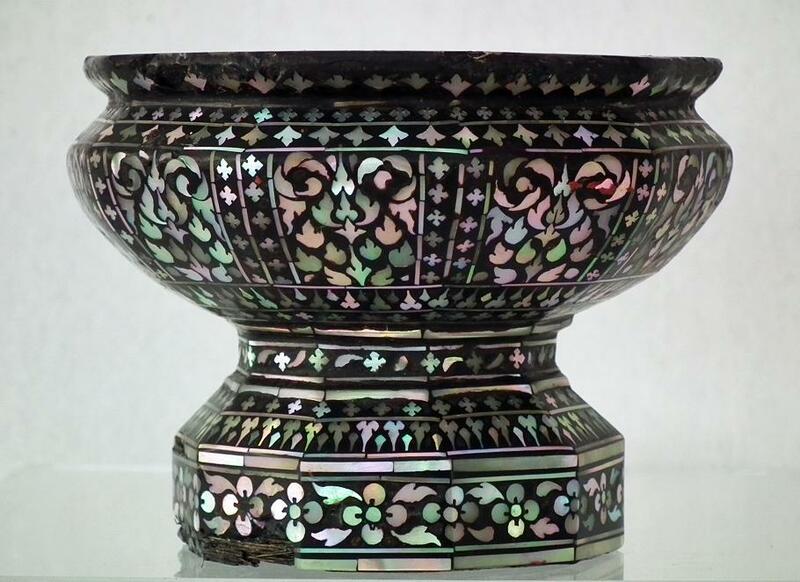 The cup of rounded polygonal form with thin sides rising from a decagonal splaying foot, the exterior extremely finely inlaid with various typically Thai designs and motifs in mother-of-pearl against a black lac ground. The interior is decorated with a plain cinnabar-red lacquer. 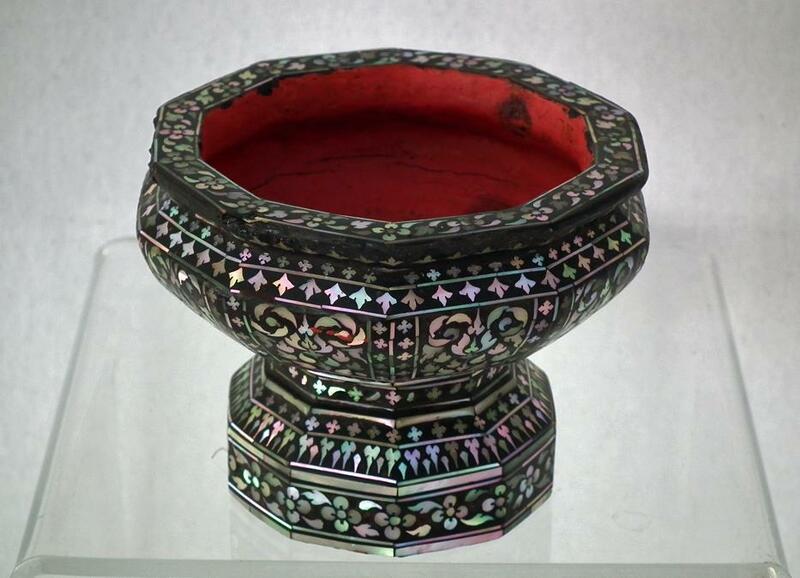 This type of footed cups usually were used to hold offering on a home Buddhist altar. 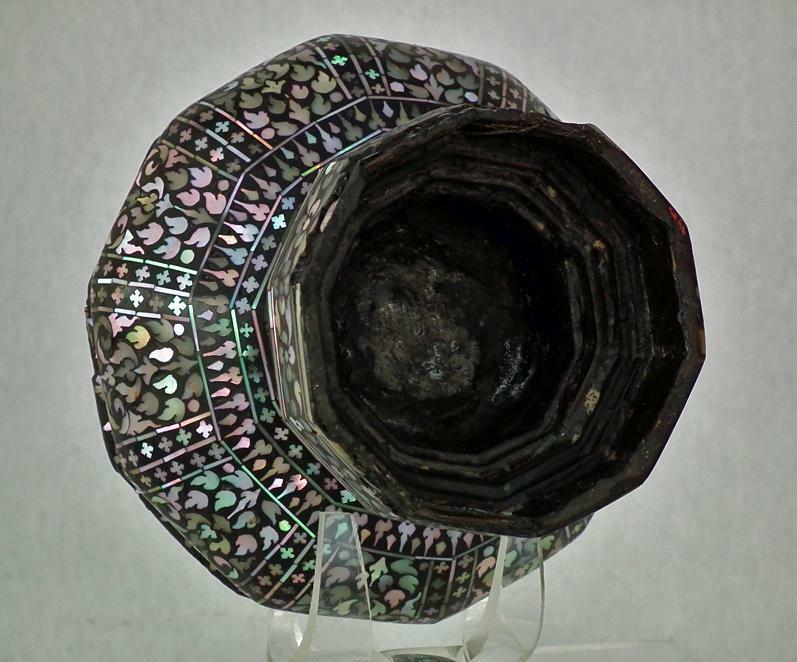 REFERENCES: A comparable cup of similar height, with missing Mother of pearl inlay, is published in the Christie’s South Kensington London catalogue: “Arts of India” 12 Jun 2014. 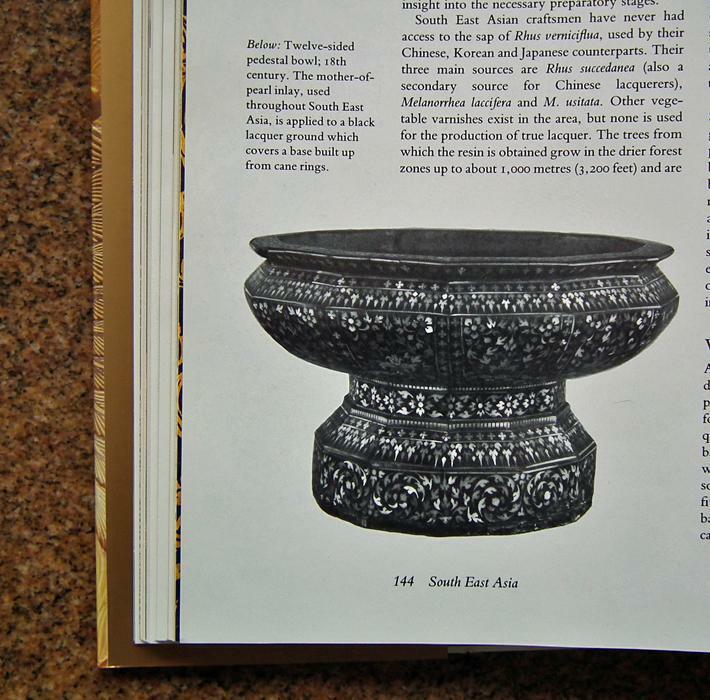 A similar pedestal bowl dated to the 18th century (also missing the Mother of pearl inlay) is published in the book, Lacquer: An International History and Collector's Guide, by Bourne, Jonathan, Et Al. Page 144 (please see the last picture attached to the listing. We will provide the buyer with a copy of the page from the mentioned reference together with a certificate of authenticity. 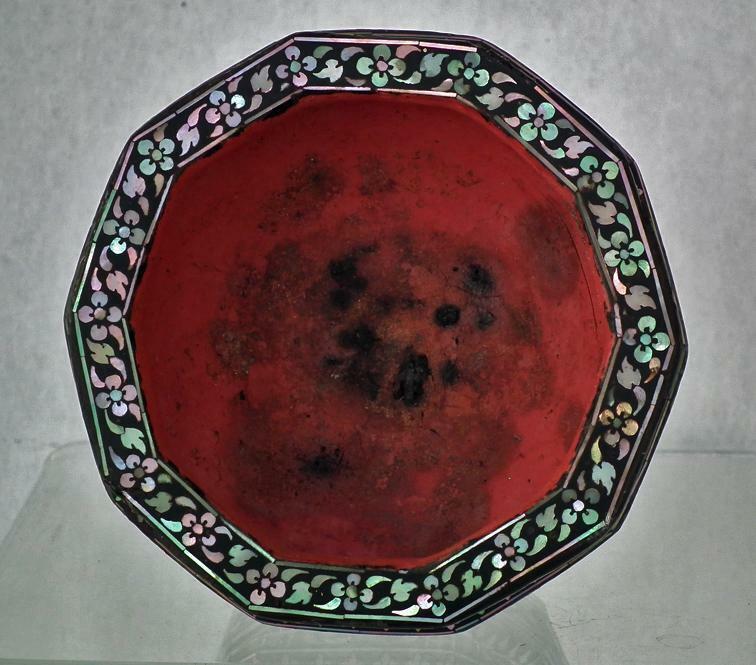 CONDITION: With signs of age and usage, there is some, age-related, missing of the Mother of pearl inlay on the base, and the rim of the cup, and surface cracking in the cinnabar-red lacquer interior. MEASUREMENTS: Diameter: 10 cm (3.94 inches). Height: 7.8 cm (3.07 inches). 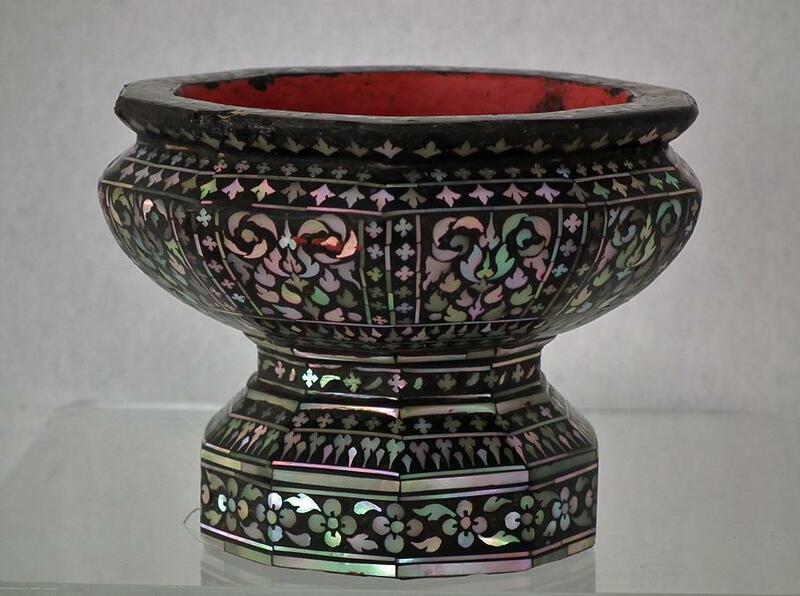 Thai mother-of-pearl inlay craft probably developed in Ayutthaya as early as the mid-14th century, of which the Thais practice in a distinctive style, is mother-of-pearl inlaid into black lacquer. It is painstaking work: The individual elements are very small and lacquer embedding involves many applications. Yet, the best Thai craftsmen have gone to extremes, not just of intricate detail, but of scale of the finished objects. The best-known examples, remarkable in their execution, are the doors of the ordination hall, or, ubosot at Wat Phra Kaeo, the Temple of the Emerald Buddha, at the grand Place in Bangkok. The mother-of-pearl is the nacreous inner layer of the shell of some molluscs, including oysters. As with pearls, the luster is from the translucency of the thin lining, while the play of colors is caused by optical interference. 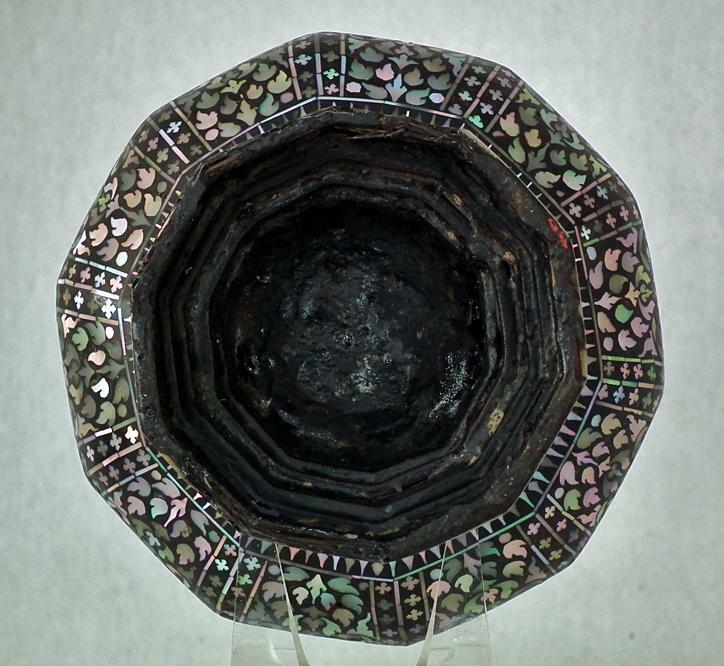 Thai craftsmen favor the green turban shell found on the West Coast of south Thailand for the density of its accretions, and because the shell is naturally curved, it must be cut into small pieces in order to assemble into flat inlay work. Even then, the pieces must be ground and polished to flatten their edges. Working with large numbers of; small pieces of shell inevitably complicates the assembly process, but it also stimulates the intricacy characteristic of inlay work. The design is first traced onto paper. Next, the outer surface of the shell is removed by grinding, and the remaining mother-of pearl sections are cut into pieces, generally no larger than 2.5cm (1 in). These pieces are honed with flint, or a whetstone, to reveal the color, and then temporarily glued to a wood backing, or a V-shaped wood mount, ready for final cutting. The design is transferred to the shell by tracing paper, which is then cut into individual pieces with a curved bow saw. Removed from the wood mount, the edges of the mother-of pearl pieces are filed smooth to fit, and pasted facedown into position onto the paper that carries the design.